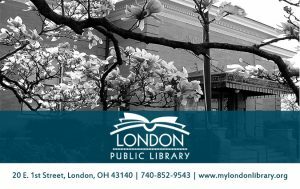 London library cards are available to any Ohio resident over the age of four. To obtain a card, you must have an Ohio Driver License or ID. If your current address is not on your Ohio Driver License or ID, a utility bill will be accepted for address verification. A parent or legal guardian must have a London library card, in good standing, in order to obtain a card for a minor (anyone under 18). Parents or legal guardians are responsible for their youngsters’ selection of materials. The Library does not restrict any materials to anyone with a London Public Library card. The parent or legal guardian is also responsible for all lost or damaged materials and fines or fees on juvenile accounts. All new library accounts will be placed on “Limited” status for 30 days with a maximum of 5 items on the account at any given time. Lost, damaged or stolen library cards will be replaced for a fee of $2.00. It is the patron’s responsibility to notify the Library if his/her card is stolen. Use of this card indicates your willingness to accept responsibility for items borrowed and fines incurred. 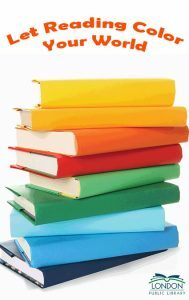 A library card or state issued photo ID must be presented to borrow library materials. Patrons are not permitted to use library cards belonging to other patrons. Student Cards are for children ages 5 – 17 and expire in September in the year of the child’s 18th birthday. These cards are given without parent presence necessary. They allow limited checkout of up to 5 books and/or audio books, access to computers, and access to all electronic library content. There are no overdue fines accrued on the Student Card. The cost of one lost or damaged item will be waived per school year.